….WHOOPIE PIES…the most amazing one I’ve ever had made by a little old woman who looked like she surely must have lived in a tiny little cabin in the woods. Best of all, no child-sized grocery carts running into my shins! It was glorious. One of the first farmers I befriended had a tiny little booth where she and her dad focused on providing the best possible specimens of potatoes, herbs, various greens and beautifully colorful bunch of greens she called Rainbow Chard. As I admired the glossy leaves, I inquired about how to cook it. “Treat it like spinach” she said. That’s all I needed to be convinced that a beautiful bunch needed to go home with me. 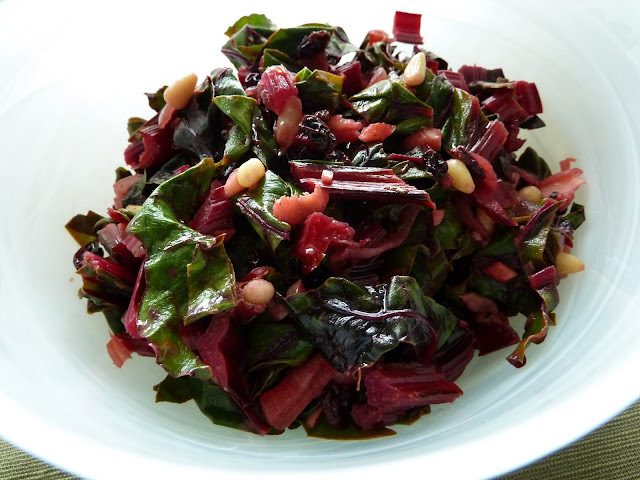 Since that day, chard has been one of my favorite go-to greens. It’s versatile (I’ve used it in pasta, soups, I’ve even stuffed the leaves with various fillings, rolled and baked them in a loose interpretation of stuffed cabbage). This recipe is one of my favorites. It’s as simple to prepare as it is beautiful. The sweetness of the currants with the bitter of the lemon juice is balanced by the toasty nuts and the savory sweet shallot and garlic. It’s the perfect side for fish, I particularly like it with scallops. If you’ve never tried chard, this is a great recipe to start with. But, be warned, it’s the gateway green into other–equally amazing–farmer’s market summer treats. I would be interested in one of your recipes that you stuff, roll & bake the chard.